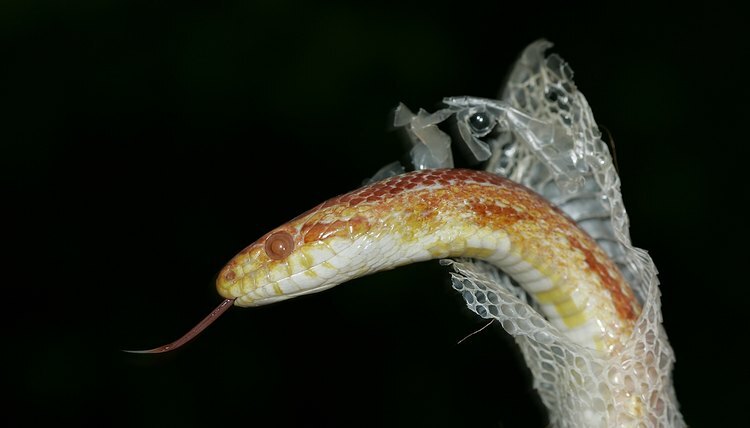 It is relatively easy to preserve shed skins, but tanning the skin of a deceased snake requires special chemicals and techniques. Preserving a shed skin takes a matter of minutes, but the tanning process will take several days. Snakes have multiple layers of skin. Layer thickness varies from one species to the next, and the outermost layer of skin -- called the epidermis -- is the thinnest layer. Snakes shed this layer periodically as they grow. Underneath the epidermis lies a thicker layer, the dermis, which snakes do not shed. The scales of the skin are formed from small sections of thick skin and are connected together by segments of flexible skin. The flexible, intra-scalar skin is usually not visible on a living animal unless it is distended due to the presence of food or young in the belly. Try to remove the shed skin from your snake’s cage as soon as possible; the sooner you remove the skin from the cage, the easier it will be to straighten any folded or inverted portions, as the skin will still be moist. Gently straighten the skin and stretch it out to air dry. You can hang the skin or place it flat on a piece of cardboard to facilitate the drying process, which should take only a few days. Once the skin is dry, glue it on some type of mounting board. Place a thin piece of glass on top of the skin to protect it. Alternatively, place the shed skin in a plastic envelope and pass it through a thermal laminating machine. This will seal the skin in plastic and protect it from wear and tear. If you intend to tan the dermis of a dead snake, you must remove the skin. Use a sharp pair of scissors to cut through the skin of the snake’s chin. Use a scalpel or razor blade to help separate the skin from the muscle, connective tissue and bones of the lower jaw. Once you have freed the skin of the lower jaw, use the scalpel to help remove the skin of the upper jaw and head from the underlying tissues. After removing the skin from both halves of the head, make a cut through the belly scales from the tip of the chin all the way down to the tail. Gather both halves of the chin skin and the skin from the top of the head in one hand, and place your other hand around the skinless head. Gently pull your hands apart to separate the skin from the rest of the carcass; practiced individuals can accomplish the feat in one smooth motion. Once you have removed the skin, open it up and lay it flat on a sturdy board with the outer surface facing down. Use a soupspoon or a dull knife to scrape away any fat or connective tissue. Roll up the skin loosely, and place it in a plastic container containing equal parts glycerin and rubbing alcohol. Be sure that the solution covers the skin entirely, and leave the container sealed for three days. Remove the skin, and scrape it again to remove any remaining tissue. Hang up the skin and spray it liberally with a coat of glycerin. Leave the glycerin on the skin for a full day, then wipe away and fluids that remain.